On November, 7, 1950, the US Ordnance Committee Minutes (OCM) published the #33476 item. This was a new classification between the heavy (120 mm gun), medium (90 mm), and light tank (76 mm), according to their main armament. At the same time, a replacement for the late WW2 standard light tank, the M24 Chaffee, was started in 1947 with research on the T37 to fit a more efficient armament to deal with armor. Added to this was chosen to make the new model air-transportable for fast deployment into enemy territory since reconnaissance was still the main duty for light tanks. Work on a longer barrel was accompanied by a more efficient rangefinder, which was deemed in 1949 too ambitious for such tank class and downgraded on the next T41 prototype. This was the final production prototype, and Cadillac’s Cleveland Tank Plant (which already had experience producing the former M5 and M24 light tanks) was chosen for the first batch in 1952. To keep mobility high, the AOS 895-3 6-cylinder gasoline engine was now rated at a comfortable 500 hp (vs. 110 hp on the M24), which provided a favorable 21.5 hp/ton (vs 16 hp/ton). The top speed gained 10 mph as a result of the engine improvement, well served by a modern wheeltrain relying on torsion bars on solid single pin track, chevron lever blocks, with five double roadwheels, heavenly spaced but further apart from one to another. The drive sprockets and idler position were shifted, the former been relocated at the rear. The upper tracks were still supported by three return rollers. The two former roadwheels pairs were suspended by shock dampers. The latter was placed on the right-hand side, behind the gunner’s location, and counted six vision blocks, a rotatable cupola, and a hatch periscope with magnification. The gunner’s had a direct vision telescope coaxial to the gun and a roof sight with magnification, protected behind an armored shutter. The gunner’s hatch located at the turret’s left-hand side was a simple piece, and a small periscope was located at the front. The turret traverse was electrical, with a manual backup. At the rear of the turret bustle top was located a mushroom-shaped fume extractor. Inside the bustle were located the radios. On the bustle back was fixed a large storage bin, to add balance to the main gun. The turret sides counted fasteners for canvas and additional storage, including fuel jerrycans. The turret front counted handles for an easier access and the mantlet was usually covered by a tarpaulin to prevent rain and snow infiltration inside the crew compartment. The driver’s hatch was located at the left-hand side, with a single piece which opened laterally. The driver could see through four vision blocks, three facing the front arc, and one the right-rear, plus a removable hatch periscope. The gun lock was used for transportation. Unlike the Sherman tank the gun lock was at the rear and offset to the left side of the tank, not in the middle like on most tanks. This was to enable the driver to get out of his hatch. If the gun lock at the rear of the tank was in the middle the rear turret bustle would block the hatch. Notice no front hull machine gun was added to the front of the M41 Walker Bulldog. This was to enable additional ammunition to be stored in the front right-hand side of the tank. The crew had to rely on the coaxial cal.30 (7.62 mm) Browning M1919A4 machine gun next to the main gun in the turret for self defense and the exterior turret mounted Cal.50 M2 (12.7 mm) machine gun. The Cal.50 machine gun could be disconnected from its turret mounting. A large caliber machine gun tripod was often attached to the rear of the turret bustle box for use by the crew on the ground behind cover. The production at Cadillac started in 1951, replacing gradually the M24 Chaffee. At the same time, the initial surname “Little Bulldog” was replaced by “Walker Bulldog” to honor the memory of a tank General killed in a Jeep accident in Korea in 1950. The production will last until 1967, when replacement by the M551 Sheridan became effective. Until then, and its first deployment in Korea, many modifications occurred, later turned into production variants. The M41A1 was the first production variant, in 1954. The electric traverse system was replaced by a hydraulic traverse, the extra room allowed to increase the ammunition storage from 57 to 65 rounds. The M41A2 appeared in 1956, with an engine upgrade, the fuel injected Continental AOS 895-3 replacing the ancient carburetor fuel system. The M41A3 was upgraded M41/M41A1 to the new fuel injection system. The M42 Duster was the anti-aircraft variant, with a twin Bofors 40 mm guns turret replacing the turret. The M41 was largely distributed among allied nations inside NATO, namely Austria (42 used from 1960 to 1979), Belgium (135 used from 1958 to 1974), Denmark (53 M41DK used from 1953 to 1998), Spain, and West Germany. The last Danish tanks were retired in 1998. They had been upgraded as the M41 DK-1 which included a complete overhaul: New engine, thermal sights for the gunner and commander, complete NBC protection lining and anti-RPG side skirts. Spain also operated 180 M41s in the 1960-70s, in a modernized version. Exports comprised also nations of the Middle East, like Jordan and Lebanon. In the latter country, 20 M41A3 were passed onto the Army of Free Lebanon, Lebanese Arab Army, Tigers Militia, Kataeb Regulatory Forces, and Lebanese Forces). In Africa, Somalia, Tunisia, and South Africa also used it. In Asia-Pacific, New Zealand acquired 10 tanks. The South Vietnamese forces received ex-US Army tanks, 30 were captured later by the NVA. The Philippines (7), Japan (147), and Thailand (200) also used the type (now all retired). Taiwan still operates some 675 M41A3/M41D in service today. The M41D is the local upgrade developed for the Marine Corps and Army, comprising a new gun, modern FCS, thermal sights and new computerized targeting systems, a Detroit Diesel 8V-71T diesel engine, side skirts and reactive armor. Taiwan also developed the experimental Type 64 with a new 520 hp diesel engine and coaxial GMPG machine gun. South American nations also purchased the M41, namely Chile (60 M41A3, now retired), the Dominican Republic (12 M41B now retired), Guatemala (12 ex-Danish DK), and Uruguay (22 M41UR and 24 M41B). The M41UR was developed for export in Denmark and comprised a 90 mm Cockerill cannon and a Scania DS-14 diesel engine.Brazil was also a proficient user of the type (300 tanks), and developed local upgrades, the M41B and M41C. The first one comprised a new FCS, new Belgian Cockerill 90 mm main gun, a DS14 Scania diesel, Groton electric generator, smoke grenade launchers, and armored side skirts. The M41C was a much thorough modernization with a computerized FCS, new night sights and radio, by the Sao Paulo based Bernardini Company. They are all retired now or have been exported. NIMDA systems of Israel also developed an export package comprising a modernized FCS, new diesel engine and new cooling system. The M41 was a real improvement over the M24 Chaffee, it was even more mobile and agile, well-armed to deal with lighter armor than MBTs and ww2-era tanks, with an accurate and fully stabilized main gun. It was simple to operate, maintain, with an engine which can be quickly replaced on the field. However, it was also found cramped, noisy (a real problem in reconnaissance missions) with an engine of high consumption with limited range. Later foreign upgrades included systematic replacement of the powerplant for a sober Scania or Cummins diesel engine and extended fuel capacity. The M41 was also too heavy for air transport. Prospects of parachute-dropping were abandoned, airlifting by helicopter impossible even for the twin-rotor Chinook, and deployment eventually was confined to heavy-duty global transporters like those used in Vietnam. In 1952 work began on lighter designs like the T71 and T92, also abandoned. The M41 was not amphibious or treated NBC, but this was not seen as a problem given the fact others contemporary MBTs were not either. The M551 Sheridan tried to respond to these limitations with an NBC, amphibious aluminum alloy hull which solved the weight issue as well as an innovative missile cannon system to compensate for the firepower issue. However, this model had troubles of its own. Foreign upgrades addressed many of the issues listed above which allowed to keep it in service until recently or up to this day. By 1953, the M41 was first deployed in Korea, in first numbers. Known as the T41, it was deployed apparently without proper gunnery training and a troublesome rangefinder. These issues were addressed later. However, it performed much better, as intended, than the M24 facing North Korean and Chinese T-34/85s. In 1961, 160 were passed onto Japan Ground Self-Defense Force in addition to the local Type 61. The main theatre of operation for the M41 was Viet-Nam. 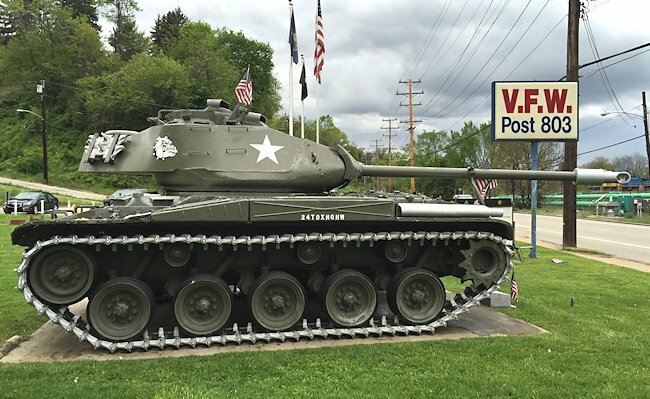 At first, it replaced the few M24 Chaffee inherited from the French in 1964. The M41A3 was first used by units of the ARVN in January 1965, followed-up by American vehicles with the UD deployment in 1965-66. The ARVN used the model intensively until the end of the war and appreciated the type as more adapted to their smaller stature, as well as handling and reliability. A Massive combined ARVN (1st Armor Brigade)/US (airborne and cavalry units) assault on Lam Son in Laos (Operation Lam Son 719) in February 1971 saw the M41s massively engaged, with a deep penetration and disrupted as intended the NVA supply lines in the area. This saw a tank battle, with 17 M41s knocking out 22 NVA tanks (6 T-54s and 16 PT-76s) for the loss of 5 M41s. In 1973, the ARVN still deployed about 200 M41s. The simplest way to tell an M41 Walker Bulldog from an M24 Chaffee is the M24 did not have a muzzle brake blast deflector and the M41 drives from the rear whereas the M24 drive sprocket are at the front. There are lots of other smaller detail differences. Video: “Inside Chieftain’s hatch” serie M41 episode. M41A1 Walker Bulldog early production, USA 1955. M41A2 of the US Army in Viet-Nâm, 1968. M41A3 of the USMC in Viet-Nâm, 1960s. 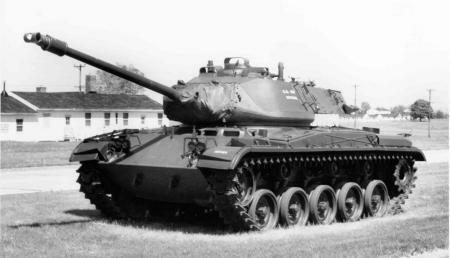 M41A3 of the US Army, 1960s. Lebanese Arab Army M41A3, 1985. Uruguayan M41UR. This Danish-converted version for export was given a 90 mm Cockerill cannon, associated optics and FCS, and a Scania diesel. Taiwanese M41D modernized, as of today. In WOT this tank has an auto-cannon option. Was this an option in the M41? Is there(or will there be) a page for the 90mm Gun Tank T49? the prototype that was going to replace the M41 and served as a testbed for the XM551 turret and 152mm? actually, now that i think of it, did the T49 or M41 serve as a testbed for the XM511’s turret and gun? The US Marine Corps never used the M41. In Full Metal Jacket they used M41s from ex-Belgian stocks, I believe, which was possible because it was filmed in England. Is There A Chance You Will Ever Do the Type 64 Light Tank ? In the text it says the armour was 38 cm/380mm in the turret mantlet but in the specificatons its 38mms. The West Germans couldn’t upgrade them in the late 1970s, because they were retired between 1965-1969. Agreed. The USMC discarded the M3’s and M5’s left in its inventory post-WW2 and never adopted the M24, M41 or M551.